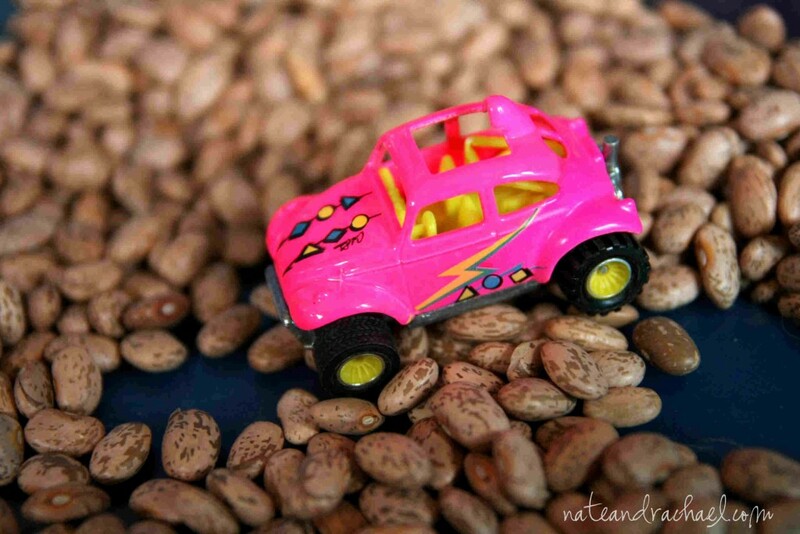 What’s in a bean sensory bin? Are you on pinterest? 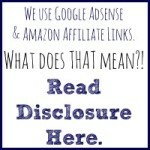 I recently joined an awesome group of bloggers in a collaborative board. 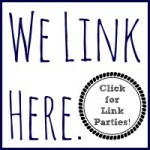 If you aren’t already, follow me and follow the Kid Blogger Activities and Crafts board. You will be overwhelmed (in a good way!) with ideas for you and your kiddos. 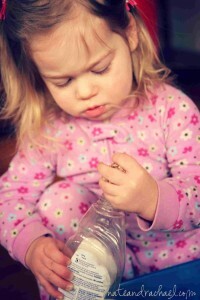 One thing that’s pretty big in the kid blogger network is sensory play. We’ve done a few special sensory activities (like this Halloween bin, sensory bags, and–my favorite!–gel balls), but the one sensory staple in our house is our bean bin. What’s in our bean sensory bin? I’m so glad you asked! For starters, beans. Beans (dried, uncooked, found in the grocery aisle) are cheap and relatively easy to clean up and keep contained. Rice and lentils are two popular alternatives. Trash. What? You don’t let your kids play with trash? Does it sound better if I call it “recycling”? We have an old dish soap bottle, berry boxes, and plastic cups. Kitchen utensils–funnels, measuring cups, spoons, old sippy cups that are cracked and won’t hold liquids. Beach gear–a sand bucket, shovel, rake. 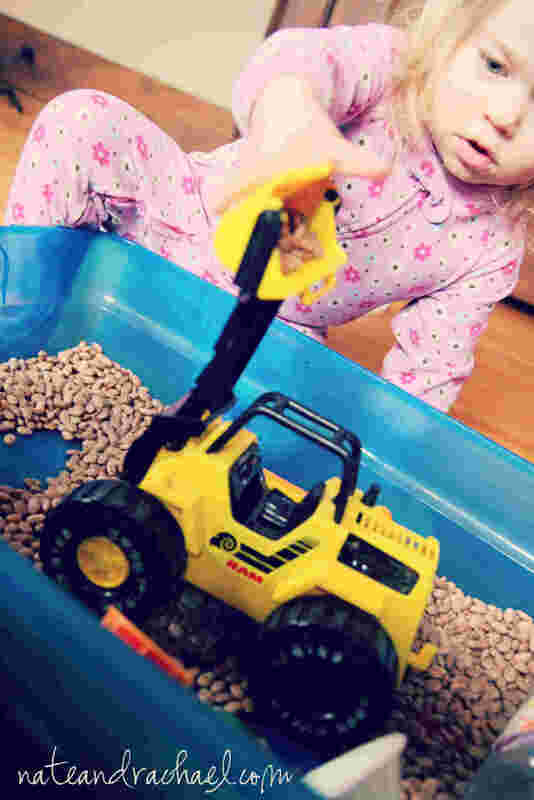 Construction toys and cars—our daughter loves airplanes and big, “manly” machines. We encourage this by surrounding her with trucks, cars, cranes, diggers, and dump trucks. As it turns out, beans are a great substitute for dirt in a sensory bin. (Although, come to think of it, real dirt would be fun! We’ll have to try that outside this summer!) These toys don’t live in the bean bin, but they are often added in when we bring out the bin. What about you? 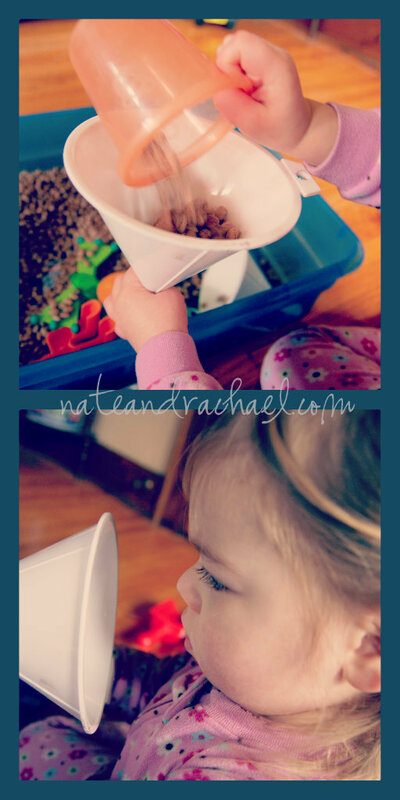 Do your kids play with sensory bins? If so, what’s in your bin? We just started with sensory bins and are loving it so far. We’ve done shaving cream and rice. I definitely want to try with the beans sometime soon!